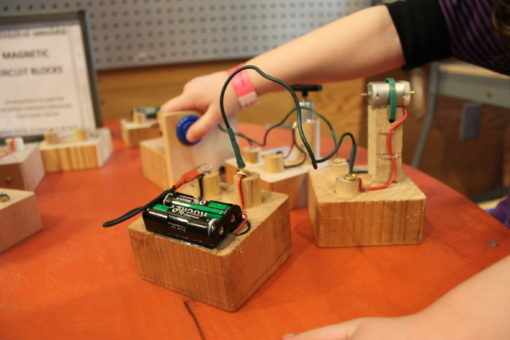 Circuit blocks are a very popular part of MAKESHOP. But there has been a single pressing problem within our design that has plagued teaching artists for the past several years. We use alligator clips to connect our blocks together and the problem with these is that our younger visitors have trouble manipulating these clips. It is quite the strain on their fine motor skill capabilities to open and close the clips. This problem has been addressed by almost every single MAKESHOP teaching artist in some form or another. We have tried putting washers on the clips to increase their surface area and to give kids some leverage. This solution works great in a classroom but these wires did not last very long in the hostile environment of the Museum. We tried input/output “banana” plugs; these also broke. We tried exposed pieces of steel wire; nobody wanted to use these. Nothing seemed to work. A couple months ago I started building some “soft” circuit blocks. You can read more about this experiment here. These blocks used magnets to attach the “soft” wires to each block to complete the connection. 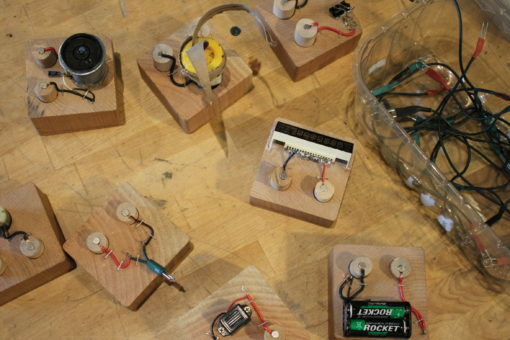 These particular prototypes, along with an example presented to me by another museum, helped inspire me make a set of magnetic circuit blocks. 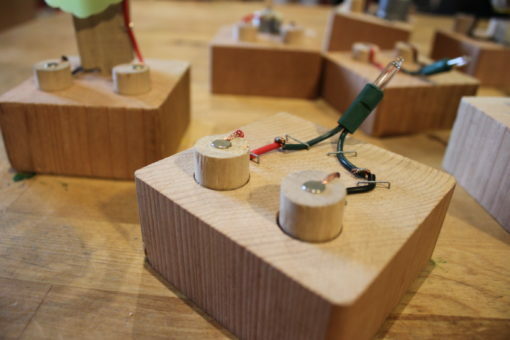 These magnetic circuit blocks were intentionally made to be very uniform and simplistic. 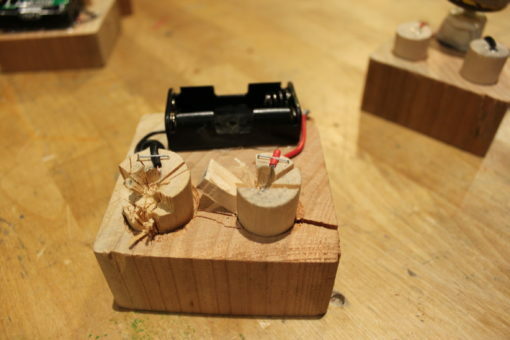 All of the blocks are made out of similar pieces of wood with just two connection points (dowel rod posts with a magnet embedded in them). Our current model of circuit blocks sometimes contain three or more connection points that create a level of complexity that I was trying to avoid with the magnetic blocks. The idea was to create an almost “junior varsity” version of our current “varsity” circuit blocks. With the hope being that children who were impaired by the alligator clips could now make an easier connection between the blocks using magnets and metal wires. As the picture above shows, these blocks didn’t always work. As with everything in MAKESHOP they eventually broke. Failure is part of the design process. 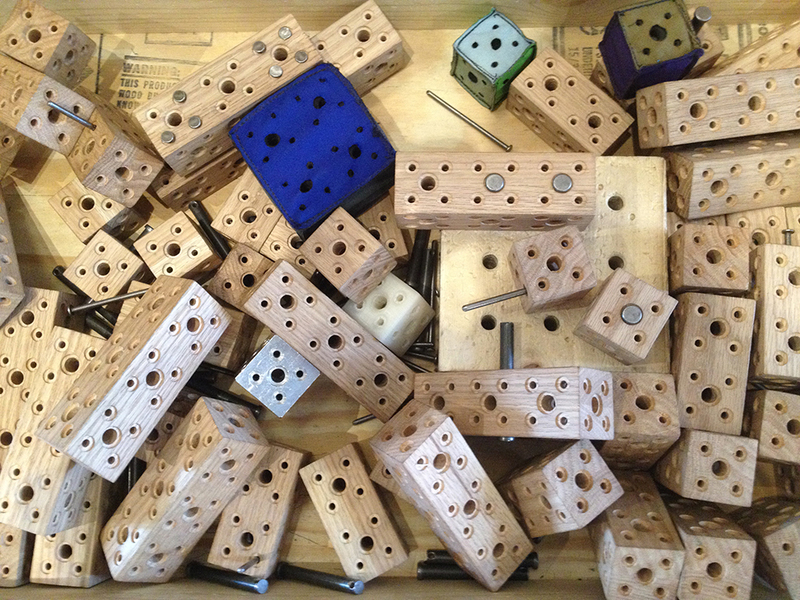 I continued to polish and perfect the design of the blocks and was able to make them more sturdy and durable. Making the wires to connect the blocks together was an entire process on its own. 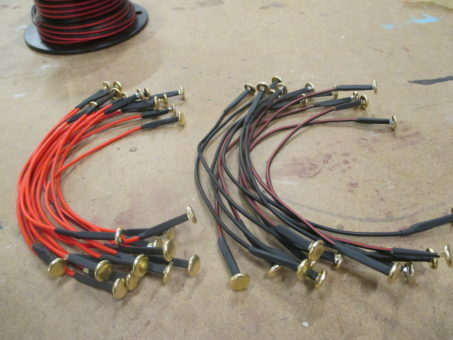 I couldn’t purchase the kind of wire that I needed for this project. I had to make something from scratch. I tried a couple of different iterations on a single design for the wires. I needed to have something light yet also metal/magnetic on the ends of the wire. 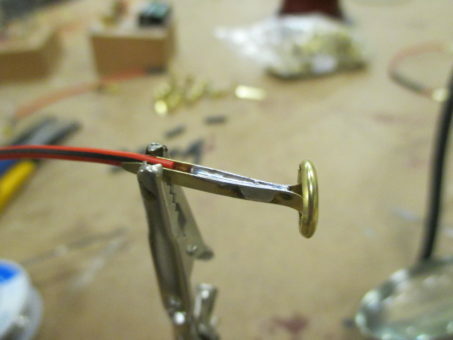 I started out using small square nuts that I soldered onto the end of an insulated piece of wire. These turned out to be a little too magnetic. I discovered this when I went to pull the wires off of the magnets on the blocks and the wire came off but the square nuts remained connected to the block. The next version used paper clips instead of square nuts. These worked a little bit better; but the paper clips were too fragile for the chaos of the Museum floor. Pictured above and below are the latest iteration of the wires. I ended up using stronger wire and created a “sandwich” using a brass fastener as the bread and “solder” as the condiment. I also used heat-shrink tubing and a heat gun to help secure everything together. So far these wires have held up pretty well. This project has been really rewarding. I had to make up a lot of the steps as I went along. There were no instructions for these circuit blocks. I had to try things out and learn from my mistakes.